Android tablets have definitely been one of the major talking points at this year's IFA. The Samsung Tab may have been one of the headlines of the event, but that shouldn't take away from other vendors such as Elonex who are also offering new tablets at competitive price points. The Elonex eTouch will cost 150 Euros or 199 Euros for the 7-inch and 10-inch variants respectively – there's a resistive touchscreen. However, we have to say that Elonex has been somewhat unimaginative when it comes to design – it's a dead ringer for Apple's famous tablet. The 10-inch eTouch weighs 695g – just 15g more than the iPad. Here the 7-inch (top) and 10-inch eTouch tablets are housed in keyboard dock accessories - there's a USB port to connect up such peripherals. 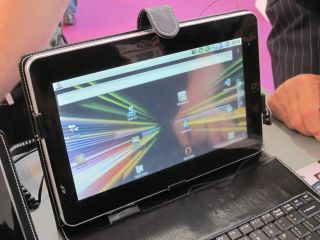 The 10-inch model is most of interest – it's sporting Android 2.1 and runs on a speedy 1GHz LNX ARM processor. That's clocked considerably higher than Viewsonic's ViewPad7 we saw the other day. There's 2GB of on board stortage and 256MB of memory, Wi-Fi plus a micro SD slot. There's also a G Sensor for orientation.